This star spangled 9-Month program begins September 2016. Block of the Month includes pattern and fabric for top and binding. 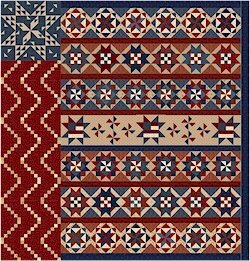 Finished quilt is 74 1/2" by 78"
The quilt is available in two versions: with center 'America' appliqué row or with center pieced row. Please let us know which version you choose to make. Order Month 1 online and then we will contact you for billing information. $ 28.95 per month.